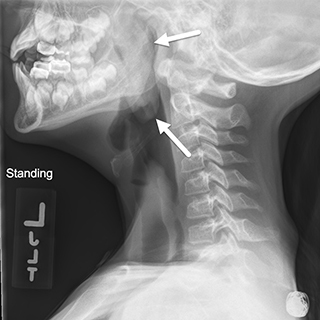 A 7-year-old female presented to the emergency department with a one-week history of sore throat, dysphagia, and a “slimy” sensation in her posterior pharynx. Her parents reported that she had been snoring while sleeping. Upon examining her pharynx, a 1 cm purple, cobblestoned mass with white exudate was visible in the posterior pharynx and the uvula was displaced to the left. The mass appeared to originate from the nasopharynx, and its inferior aspect was at the level of the epiglottis. Based on the initial symptoms, an airway radiograph was obtained. 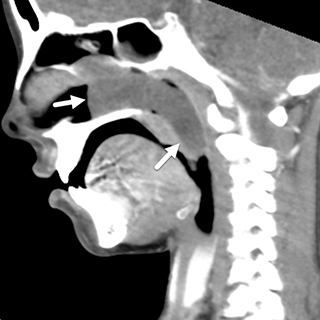 The radiograph showed a large polypoid mass obstructing the right nasal cavity, the nasopharynx, and extending to the epiglottis (Figure 1). A flexible fiber optic exam was performed in the emergency department; an obstructive polypoid lesion in the right nasal cavity was noted. 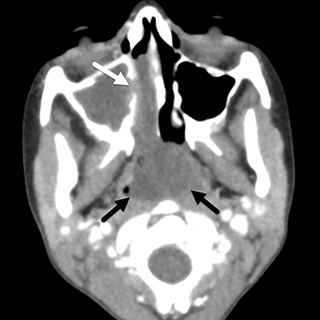 A CT scan of the sinuses was performed with intravenous contrast (Figure 2). 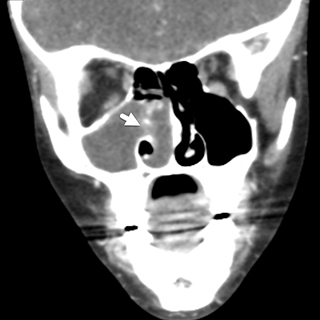 The CT showed opacification of the right maxillary sinus with thickening of the maxillary sinus walls, consistent with osteitis secondary to chronic inflammation. 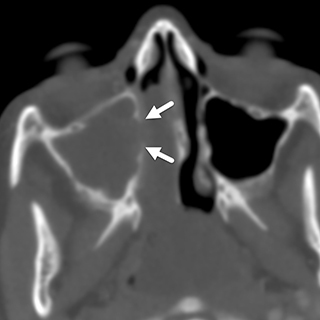 A low-attenuation, nonenhancing mass was also present, extending from the right maxillary sinus through an enlarged ostium and then projecting posteriorly through the right nasal cavity into posterior nasopharynx. Its diameter in the nasopharynx was approximately 3 cm. There was moderate mucosal thickening in the right sphenoid sinus. The remaining paranasal sinuses were clear. There was no adenopathy or other soft tissue mass. The antrochoanal polyp is an inflammatory nasal polyp found more frequently in children than adults. It represents up to 42% of all nasal polyps in children and 4-6% in adults.1-3 Killian first described the polyp as a solitary mass with both cystic and solid components in the maxillary sinus extending into the nasopharynx.3 The polyp can enlarge enough to be visible in the oropharynx, similar to the patient presented in this case. Nasal polyps are benign mucosal growths indicative of chronic inflammation. They arise most commonly in the setting of chronic sinusitis in adults. In children, allergic polyps are more common than inflammatory polyps.3 There is debate regarding whether an association exists between allergic rhinitis and antrochoanal polyps.4 In adults, histologic findings such as inflammatory cell infiltration and lack of eosinophils suggest that antrochoanal polyps are a result of inflammation and are less of an allergic process.5 On microscopic examination, antrochoanal polyps are lined by pseudostratified ciliated columnar epithelium, which is similar to nasal mucosa. The stroma is composed of loose connective tissue and is edematous.4 Allergic polyps also contain an edematous stroma but are predominantly composed of eosinophils. The gold standard for diagnosing an antrochoanal polyp is a CT scan showing a hypodense mass arising from an enlarged, opacified maxillary sinus.3 The polyps do not cause bony destruction.6 However, when large, they can expand and enlarge the ostium. The location of the polyp and its soft consistency, cause its characteristic dumbbell shape. In our case, the patient was taken to surgery and underwent a right maxillary antrostomy and polyp exterbation with curetting of mucosa in the maxillary sinus. She has received follow-up care from ENT specialists who have noted no evidence of recurrence of the antrochoanal polyp. In general, follow up care should be continued for at least 2 years after surgery in order to detect 95% of recurrence. Our patient will continue to receive routine follow-up care over this span, and her prognosis is excellent. The antrochoanal polyp is a rare, benign, nasal polyp found primarily in children. The risk factors leading to its etiology are unclear. Comprising nasal mucosa, it originates in the maxillary sinus and can cause symptoms of nasal obstruction. The polyp can be definitively diagnosed on CT. Treatment involves surgery and recurrence is rare if the entire polyp is removed. Segal N, Gluk O, Puterman M. Nasal polyps in the pediatric population. B-ENT. 2012;8(4):265-267. Frosini P, Picarella G, De Campora E. Antrochoanal polyp: analysis of 200 cases. Acta Otorhinolaryngologica Italica. 2009;29(1):21-26. Al-Mazrou KA, Bukhari M, Al-Fayez AI. Characteristics of antrochoanal polyps in the pediatric age group. Ann Thorac Med. 2009;4(3):133-136. doi:10.4103/1817-1737.53353. Yaman H, Yilmaz S, Karali E, Guclu E, Ozturk O. Evaluation and Management of Antrochoanal Polyps. Clin Exp Otorhinolaryngol. 2010;3(2):110-114. doi:10.3342/ceo.2010.3.2.110. Min YG, Chung JW, Shin JS, Chi JG. Histologic structure of antrochoanal polyps. Acta Otolaryngol. 1995;115(4):543-547. Towbin R, Dunbar JS, Bove K. Antrochoanal polyps. AJR Am J Roentgenol. 1979; 132:27-33. Chaiyasate S, Roongrotwattanasiri K, Patumanond J, Fooanant S. Antrochoanal polyps: How long should follow-up be after surgery? Int J Otolaryngol. 2015;2015:297417. Chagarlamudi K, O’Brien WT, Towbin RB, Towbin AJ. Antrochoanal polyp. Appl Radiol. 2019;48(1):38-40. Prepared by Dr. Chagarlamudi while at Case Western Reserve University, University Hospital-Cleveland Medical Center, Cleveland, OH; Dr. O’Brien and Dr. Alexander Towbin while at Cincinnati Children’s Hospital, University of Cincinnati College of Medicine, Cincinnati, OH; and Dr. Richard Towbin while at Phoenix Children’s Hospital, Phoenix, AZ.